US authorities have charged four men with looting bones and body parts from more than 1,000 corpses and selling them for medical transplants. Brooklyn District Attorney Charles Hynes said the scam was "like something out of a cheap horror movie". 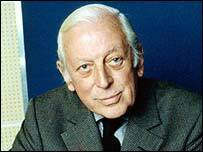 The body of BBC broadcaster Alistair Cooke, who died aged 95 in 2004, was among those used in the racket. The lawyer for one of the suspects, former dentist Michael Mastromarino, said his client denied the charges. The indictment also names two of Mr Mastromarino's employers - Lee Crucetta and Christopher Aldorasi - as well as funeral home operator Joseph Nicelli as participants in the scheme. Prosecutors say the defendants made millions of dollars from selling body parts harvested from corpses obtained from Mr Nicelli's funeral home. Bones, organs and tissue were allegedly sold by Mr Mastromarino's Biomedical Tissue Services Ltd to unwitting clients for implants. Death certificates and consent forms are alleged to have been doctored to make it appear the donations were legitimate. Stolen parts from Alistair Cooke, who died from cancer, were allegedly shown to have come from a healthy 85-year-old who died from a heart attack. Prosecutors said the men discarded gloves, aprons and other items inside the stripped corpses before sewing them up. They are also alleged to have replaced stolen bones with PVC piping. "The amount of callousness here is incalculable," said Mr Hynes. "What happened here... is like something out of a cheap horror movie." "But for the thousands of relatives of the deceased whose body parts were used for profit, and the recipients of the suspect parts, this was no bad movie. This was for real," he said.